Picture this. You hop into the car with your three kids and husband and head out for a 3+ hour drive. Within 30 minutes the dreaded, “I’m hungry…” whining begins. Now you are rummaging between your legs, trying to find your purse that is stuffed to the brim to find a snack for the kids. You rip open the package and the contents go flying. You start to grumble as the whining gets worse. Been there? Done that? 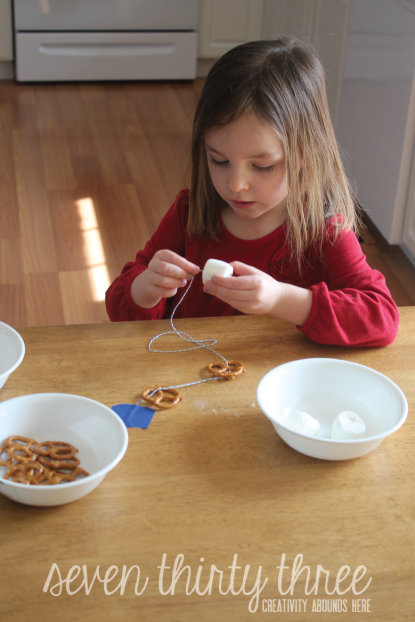 Let’s make a simple solution – Snack Necklaces! It’s a fun craft for the kids to make which satisfies their little tummy’s while traveling, or any time really!Maybe they’re underfoot as you’re trying to pack the car? 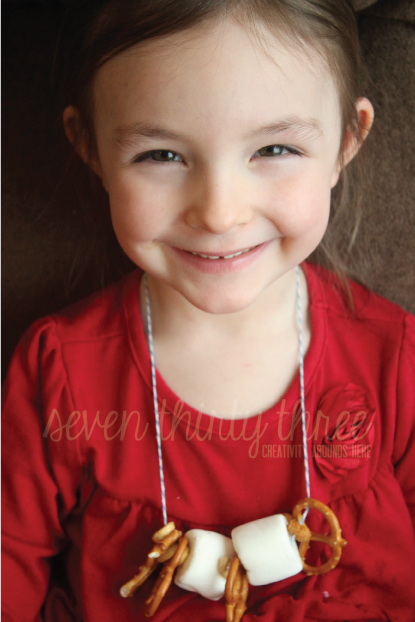 Set up a necklace making station beforehand!Make this their “job” so that they feel included in the preparations. 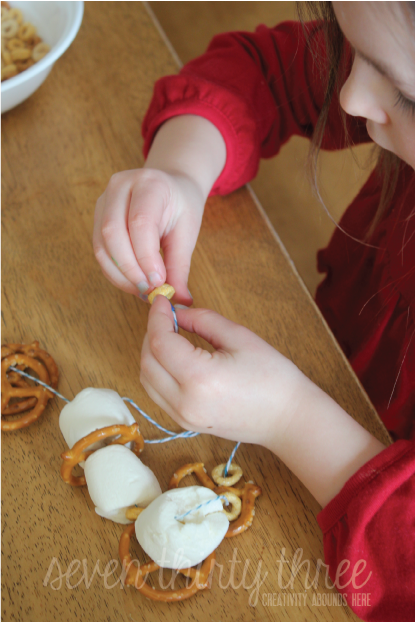 All you need is food with holes – cheerios, fruit loops, pretzels, gummy rings – and string. (I added holes to marshmallows and that worked fine. Keep in mind that they can be sticky so if you have a little that will play with them a lot, that may not be a can of worms you want to open!) 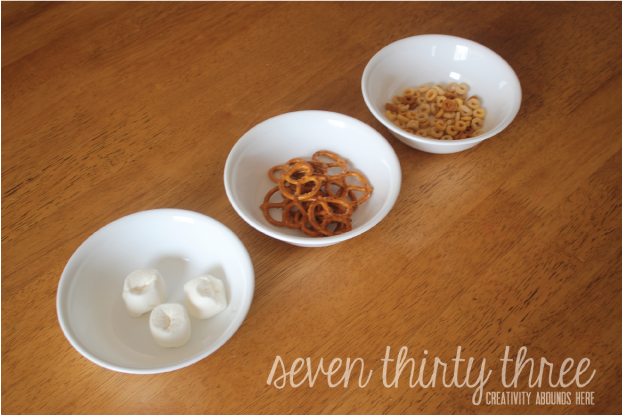 If the littles are helping, I like to separate the food items into small bowls and tape one end of the string to the table so they aren’t dropping it and spilling the contents. I also added a small amount of tape to the end to make threading it through the smaller items (Cheerios) easier. 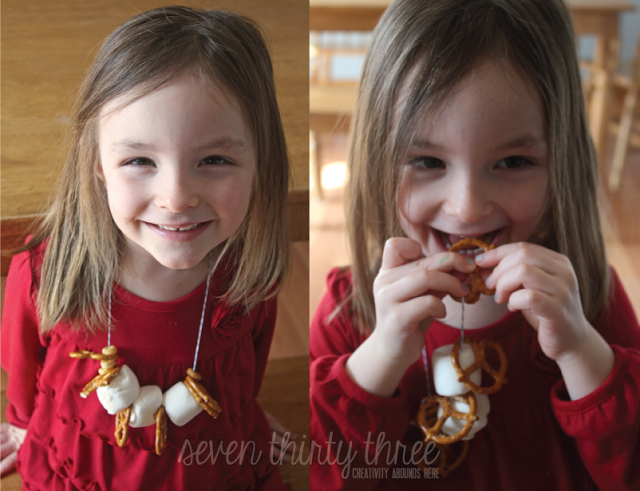 String the food on, tie into a necklace and place on your child’s head and let the munching begin! This also makes a great 100 Days of School craft! this is so cute and sweet, hopefully they dont fall asleep and have marshmallow stick to their eyes! This is a great idea! I will totally be trying this!